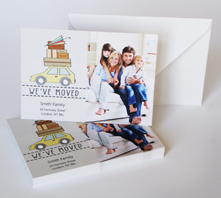 Home Moving Cards are the perfect way to let your friends & family know you are moving house or have already moved. 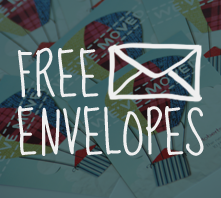 Choose a template and design your change of address card online. 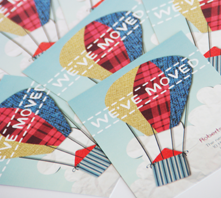 Our moving cards provide a quick and easy way to inform friends & family of your new address once you have completed your move. 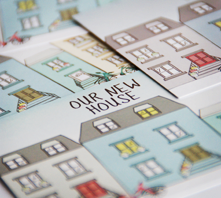 You can add the street address, post code and even a photo of your new house to one of our purpose built card templates. 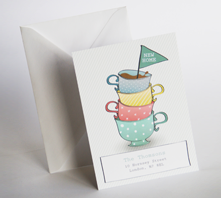 Where you can personalise the text on the card with your new address information. Here you have the option to add a photo of your new home or family, alongside your moving information. 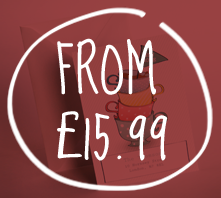 Card prices start at £15.99 for 10 Cards, and every order includes free self seal envelopes! 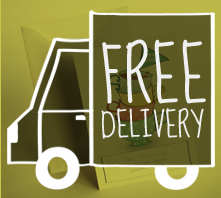 What's more, we are offering FREE UK Delivery on all orders placed on Moving Home Cards! All of our cards are printed onto high quality paper stocks, which come from FSC sources. 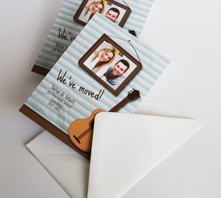 Our beautifully designed change of address card templates can only be found here. We will be adding more card layouts all the time.